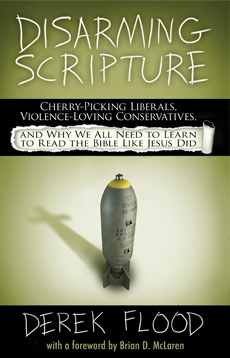 This post is part of a continuing conversation with Greg Boyd surrounding my book Disarming Scripture and its treatment of the problem of Violence in the Bible. If you want some context, you can check out my previous post, or better yet, begin with my first reply to Greg. Before I embark on my response to Greg's most recent posts to me (part1 and part2) in our continuing dialog, I wanted to say a bit about what has been happening behind the scenes (and why I did not reply sooner). It often happens in a debate that the two parties talk past each other, and because of that I thought it would be good if Greg and I could talk face to face. So Greg and I arranged to have a talk on Skype. So with the goal in mind of understanding how our two perspectives might be able to work in tandem -- functioning as compliments to each other -- in this post I wanted to clarify the different ways we are each using terms like inerrancy, infallibility and inspiration with the hopes of getting us all on the same page. To do that we'll need to dig a bit into Evangelical history. So put on some bell bottoms, set your time machine's dial to 1978, and let's take a look at the Chicago Statement of Biblical Inerrancy. The Chicago Statement of Biblical Inerrancy purports to be a definitive statement on how Evangelicals understand Scripture. Does it speak for all Evangelicals? That's debatable. Many who identify as Evangelical would disagree with the Chicago Statement, but what is certainly the case is that the signers of the Chicago Statement fully intended to speak for all Evangelicals with the statement. It reflects the belief among conservative Evangelicals that inerrancy is central and indispensable. For example, long before the Chicago Statement, upon its founding in 1949 the Evangelical Theological Society (ETS) made affirming the doctrine of inerrancy its sole doctrinal requirement for membership. Affirm inerrancy and you can be a part of this club. Don't and you will be out. The ETS tried to expel Evangelical scholars Clark Pinnock and John Sanders on heresy charges in 2003 for affirming open theism. If Boyd had been part of the ETS at the time he would have been on the chopping block with them. Instead he spoke before the ETS and defended Pinnock and Sanders. What does this all have to do with inerrancy you ask? The charge of heresy was grounded on the claim that open theism was incompatible with inerrancy. In the aftermath of this, the ETS voted in 2006 to define their understanding of inerrancy based on the Chicago Statement in order to avoid any future ambiguity in how inerrancy was understood by its members, spelling things out for everyone. Here's the bottom line: While not everyone within the Evangelical camp affirms inerrancy (or infallibility as defined in the Chicago Statement for that matter) this "biblicist" understanding has been the key battle line of the 20th century that many conservative Evangelicals have drawn to determine who is in and who is out. Those who have denied it, or even attempted to tweak it, have faced the very real possibility of losing their jobs or even their careers. Why don't you hear much about open theism these days from Evangelicals in books or academic articles? Because the ETS did a pretty good job of shutting down the conversation, and Chicago-style Evangelicals have also done a good job of shutting down lots of other conversations as well -- whether it's on Scripture or gender or politics or a host of other issues. That's kind of their thing. They are the Pharisees of our day, and they have a lot of influence and power behind them. They are the ETS, Christianity Today, The Gospel Coalition, The Southern Baptist Convention, IHOP (not the ones with the pancakes), and host of other institutions who seek to influence not only theology, but social issues and politics as well. It is important to understand this history and how it impacts us. For those of us who come from an Evangelical background, this all has had a huge impact on how we see the Bible. This is not just a minor hiccup or the view of a small minority, it has shaped how Evangelicalism has developed throughout the 20th century in regards to how Scripture is understood and applied. Now, it's important to stress here that Boyd and I both do not accept the understanding of inerrancy or infallibility as they are expressed in the Chicago Statement. This is not simply because the Chicago Statement sees inerrancy and infallibility as inseparable (i.e they insist that you can't affirm infallibility without equally affirming inerrancy). Much more pertinent to the topic at hand (which in case you forgot is the moral problem of divine sanctioned violence in the Old Testament) is that the Chicago Statement insists that Scripture must be interpreted by grammatical-historical exegesis. We affirm the necessity of interpreting the Bible according to its literal, or normal, sense. The literal sense is the grammatical-historical sense, that is, the meaning which the writer expressed. In other words, what Boyd refers to as the "surface meaning" of the text, according to the Chicago Statement, is the only legitimate way to read it. If the text says that God commands genocide, then this is what is infallible and right. That is how Chicago-style Evangelicals understand infallibility. This understanding represents the dominant view among Evangelicalism. Take a class in exegesis in seminary and that is what you will learn. I love Chicago-style pizza, but I am not a fan of Chicago-style infallibility. Greg agrees (on the Bible part anyway, I don't know about the pizza part). Greg, in affirming infallibility, clearly does not understand it as those Evangelicals who affirm the Chicago Statement do. In his most recent reply to me, Greg refers to Chicago-style infallibility and inerrancy as a "recent, and unfortunate, application of this doctrine" by "certain Fundamentalists and Evangelicals in the 19th and 20th century." At the same time, in that same post, Boyd maintains that "theologians within the historic-orthodox church have always confessed that Scripture is 'infallible' or 'inerrant.'" Since Greg sees the Chicago-style understanding of inerrancy and infallibility as an unfortunate misapplication, this would mean that Chicago-style Evangelicals – who have dominated the Evangelical theological scene for the past century or more, and who themselves claim to be the gatekeepers of that very orthodoxy – have been getting their orthodoxy completely wrong all this time. Greg bases his declaration that the church has always believed in infallibility and inerrancy on a book by J. D. Woodbridge entitled Biblical Authority: A Critique of the Rogers/McKim Proposal. Woodbridge is one of the original signers of the Chicago Statement, and his book is an attempt to argue that the church has always believed in inerrancy, understood precisely in the way it is defined in the Chicago Statement. In other words, the author of the book that Boyd is citing to back up his claim that the church has always embraced infallibility would completely disagree with Boyd on what infallibility means, since Boyd holds to infallibility but not inerrancy. As the book's subtitle indicates, Woodbridge's book is a critique of Rogers and McKim's book The Authority and Interpretation of the Bible: An Historical Approach. In their book, the two young Evangelical scholars argued (as Greg Boyd also does) for embracing a belief in infallibility but not inerrancy. Rogers and McKim's book is itself a response to Harold Lindsell's bombshell book The Battle for the Bible, which was the impetus behind the Chicago Statement. That was a kind of a mouthful, so let me sum things up: First Lindsell writes Battle for the Bible and makes the case that the church has always believed in Chicago-style inerrancy, and calls out all sorts of Evangelical groups who he feels are not towing the party line in that regard. Rogers and McKim write a book in reply and say, nope, the church has always believed in infallibility, but not inerrancy. Woodbridge then writes a book rebuking them, arguing that Lindsell was right and the church has always believed in Chicago-style inerrancy so get with the program boys. All three of these books cite Origen, Chrysostom, Augustine, Luther, and Calvin as advocates of their particular view. That is, they are disagreeing with each other, but all citing the same sources to back up their divergent claims. What we can observe in all of these works, therefore, is an example of an unfortunate tendency among Evangelical academics to read anachronistically -- projecting their own doctrinal assumptions into a text because they find similar words being used, rather than looking to uncover how these terms are being understood by the historical sources, who (not surprisingly) see things in a very different way, being from a different time. Now, I certainly think there is great value we can derive from looking at how prominent figures from church history such as Origen or Luther have understood Scripture. However, I do not believe we can look to a single view that has always been held. Instead, what we find is that there has been a wide spectrum of diversity as to what inspiration (let alone infallibility or inerrancy) means and how it is understood. I note this neither to endorse Luther's view, nor to disparage Origen's, but to underline that there simply is no single view of inspiration or interpretation that is shared throughout church history. Rather, we instead find a wide spectrum of diversity in how Scripture is read and understood. The fact is, our Evangelical heritage is that of a mutt, not a purebred poodle. That's who we are, and I wouldn't want it any other way. What we can perhaps see as a common thread in all of this is that the inspiration of Scripture (understood in various ways) has been maintained throughout church history. That is, I believe, one of the reasons why Greg stresses the importance of holding on to the doctrine of inspiration and infallibility. He recognizes something good there that he wants us to hold on to, even if that's hard. For Greg what is important here is that we not let go of the affirmation that all Scripture -- including its morally troubling parts -- is somehow, nevertheless, inspired. We may have to dig deep to uncover this, but we should not simply cast it aside -- we must continue to wrestle with the text as a part of our own sacred Scripture. I would agree with all of that. What I want to stress is that in doing this, there needs to be room for an honest moral critique of these troubling texts, which includes a repudiation of what they plainly say. We must allow people to state that these texts are not Christlike, not praiseworthy, and indeed that they are immoral in what they affirm. So if we are going to employ a hermeneutic that looks past the "surface meaning" of the text, this cannot mean that we say that those who call out the clear moral problems in the text are somehow misreading it. The text itself really does say bad things, and this is critical for us to face and own. Scripture is inspired, and at the same time it says some things that are wrong and immoral. Holding these two truths in tension simultaneously is hard to do. The tendency is to want to pick one side or the other. Consequently those who question the Bible are often seen as being on the outside of the faith, or perceived to be rejecting or attacking it somehow. So what's going on? Why is it that I can say something virtually identical to what Greg does, and it sounds to him as if I must be denying the inspiration of Scripture? That's the tightrope we are walking on. It is genuinely hard to hold these two ideas together in tension. It's not just intellectually challenging, it is challenging to one's faith. It requires that we re-think some of our assumptions of who God is, and that's really hard. I feel that. I find that scary... I think we all do. So what I think is needed is a lot of generosity towards one another as we work through this. Not just between Greg and myself, but with all of us post-Evangelical mutts looking to find a more Christlike faith and more Christlike way of reading the Bible. We need to make room for honest moral critique of Scripture to take place as an accepted expression of our faith, and making room for that means allowing people to say scary honest things sometimes. That's part of the normal and healthy process that moves us towards real and deep trust in God, and a life of compassion and grace. Like anything deep and real in life, this is a messy process, and we will need to give each other a lot of grace along the way. Here I am reminded of the words of Peter, "Above all, love each other deeply. For love covers a multitude of sins" (1 Pet 4:8). That does not mean we cannot disagree. But it sets the context for it to produce good fruit. The fact is, we both affirm the inspiration of Scripture, and we both repudiate violence in the Old Testament. The difference is that we do this in slightly different ways. Where I see inspiration is in how God works with the totality of the multi-vocal Old Testament canon to lead us to Christ, including the immoral parts. I do not believe that Jesus endorsed all of Scripture in the sense of endorsing the content of every verse in the Old Testament and what it affirms. Rather, I believe that Jesus endorsed all of Scripture in the sense of endorsing it as a whole, including the immoral parts, in how they all together, understood as a dialog rather than a monolog, can be read as leading us to Christ. In particular, the immoral parts can act to send us to our knees in recognizing our human tendency to use religion to justify our own hurtfulness -- just turn on the news and you can see that kind of scapegoating in the name of God and country is alive and well today. That understanding of the Old Testament helps me, and I hope it is helpful to others as well. It differs from most other treatments of the problem of violence in the Bible in that it does not seek to justify or downplay the reality of divine-sanctioned violence in the Old Testament. Greg's approach is similar to mine in that it likewise does not seek to justify or downplay the problem of OT violence, and further in that its goal is towards a Christlike understanding. However, Greg does not get there in the same way as I do, and instead focuses on what I would identify as a theology of the cross reading which seeks to find God in Christ, even in the depths of our human depravity. I think Greg is on to something really big here with this cross-shaped reading, and I look forward to his forthcoming book. I believe it will be helpful to a lot of people. My appeal, however, is for a "generosity" in how we approach Scripture. Our approaches are indeed different, but I see no reason why they cannot work together. What Greg is affirming with his understanding of infallibility is a reading that rejects OT violence as normative, and points us to Jesus-shaped love. I affirm the same, but articulate it in saying that the OT canon as a whole needs to be read in a way that leads us to Christ. I do this by laying out a practical proposal for how we can identify in the multi-vocal OT texts what is Christlike and what is not. Greg's cruciform reading actually presupposes that deliberation since we can only know to go "deeper beneath the surface" once we have identified that a particular text that claims to speak for God is in fact un-Christlike, requiring us to dig. So in that sense you could say my book tills the soil for Greg's. The fact of church history is that there have been many different ways that people have approached Scripture, and we can see this diversity further in the different ways that Greg and I both get to our understandings of inspiration. I propose that, rather than looking for the one right view or formulation, we should instead make room for many ways of approaching the issue. What matters most is where we land when we do this -- that is, the fruit our theology bears. From what I can see, Greg and I both land on trusting in a God who looks like Jesus, and on committing to show that Jesus-shaped enemy-love to others. Just as if you were writing the dictionary. Not in response to the Chicago Folks or to Mr. Boyd or to Your Mom or the Pope. Just your simple definition. I would like to see the same from Mr. Boyd as well. Much of this, you're right, sounds like a conversation with SNL's "Rosanne Rosanadana. One of you is talking about Soviet Jewry, the other about Soviet Jewelry. That said, I found your post extremely useful and enlightening. A compendium of Post-Evangelical Bible Translation Approaches would be a fascinating book. Great post and history lesson Derek. And glad to see the two of you continuing to dialog on this. "I’m concerned that many who are currently waking up to the centrality of enemy-loving non-violence in Jesus’ revelation of God are assuming that this revelation requires them to abandon this doctrine if they are going to renounce the surface meaning of the OT’s unChrist-like portraits of God"
That's from the first of Boyd's most recent two posts that you referenced. I think it sums up Boyd's position pretty well. I basically read him as saying this - "If the only way to believe in a non-violent God is to discard "infallibility" then the faith is in trouble and the "violence loving conservatives" win since Jesus himself essentially affirmed verbal plenary inspiration - which equals infallibility." When I look at the OT/Hebrew Scriptures, the divine violence is obvious and, if I'm honest, pervasive. Period. Requiring a hidden meaning rather than acknowledging the text for what it is seems problematic and it's effectively no different than "picking and choosing" IMO. So in which verses do we choose to look for a hidden meaning and when do we accept the surface meaning? Is that not the same slippery slope? I find that all theologians already engage in this exercise anyways - the development of a meta-narrative (or trump system) that shapes how they make sense of the bits and pieces. Not a bad thing - necessary in fact. I love that I can come to this blog on any given week and find a convicting and practical message about living in the world, a dialog with someone in theological opposition, or a history lesson on the roots of current systems. It's like one-stop-shopping; I love it. How would you define these terms? Yes, and for that reason I don't think OT violence is such a big problem because we almost all find a way not to apply the OT to our lives now. What is really the problem imho is the problem of violence in the NT. That's a lot more complex and sticky. Infallible: All of the Ideas in that Bible you just purchased are correct. Inspired: God is involved in that Bible you just bought. I think those definitions work for me. So now what do we do with them? I kinda thought yours would be a bit more scholarly sounding. But hey. Moving on, I am going to bail on inerrancy, but all the ideas are all true thing.......that might work. It deserves exploration. I don't think the Bible is "Just a Book" so i am all in on Number 3. I guess that means we have to work hard to find the ideas underlying the book. You seem good at that. "all the ideas are all true thing.......that might work"
that one becomes pretty hard to swallow when it comes to things like the Bible's endorsement of slavery and such. First I would like to say that it is good that you and Boyd not only talk but are continuing the conversation in posts. As you say too often people just talk past each other in these kinds of conversations. "Biblical infallibility is the belief that what the Bible says regarding matters of faith and Christian practiceis wholly useful and true. It is the "belief that the Bible is completely trustworthy as a guide to salvation and the life of faith and will not fail to accomplish its purpose." That is something I can gladly affirm but not your much broader definition. This understanding was enforced very early in my childhood. In the 1930s when the missionaries were forced out of Ethiopia they left small churches in south eastern Ethiopia consisting of hundreds of Christians. Only small portions of the Bible had been translated. When missionaries started returning to Ethiopia they found a vibrant church numbering in the thousands. Even as a small child I saw the excitement as the various churches were discovered. That experience has left an un-erasable mark on me during my lifetime. Thus I gladly affirm the above definition of infallibility. Your definition of inspired seems rather weak to me as in much of the Bible I see that overall God ensured than his desired message got across to people and he also ensured that even the violent bits got recorded for our instruction although often I do not understand how we are to apply and understand the violent bits. In practice where I differ from Derek is that I see many of the Bible's commands as positive helps to our Christian life, see Barrs... in the book "Being Human". In the NT Derek also seems to discard teaching on penal substitution and other areas where he thinks violence is endorsed. My approach is to accept all the metaphors for the death and resurrection of our Lord although I think Christus Victor is the most important and helpful of the understandings. About slavery I do not see the Bible in general endorsing it but rather regulating slaveries worst practices. Just like women in office in the Church I see this as a matter of trajectory in scripture as humanity evolves towards an understanding that slavery is wrong. I hate the Capcha implementation in Blogger as it takes me many tries to pass what should be a simple test. It would seem to me that your definition of infallibility precludes the trajectory reading you endorse. That is, if "the Bible is completely trustworthy as a guide to salvation and the life of faith" then a trajectory reading should not be necessary. Otherwise it's like saying "you can rely completely on this instruction manual, except where you need to add in the missing pages"
No I include trajectory within the definition I gave. Maybe I should have said "It is the "belief that the Bible is completely trustworthy as a guide to salvation and the basic life of faith and will not fail to accomplish its purpose." I also include the idea that scripture contains sections where people are "riffing" on previous historical stories ie midrash. Further I accept most of the principles of modern biblical criticism except that I would NOT rule something out just because God acts in a different way than his usual acts that sustain creation (usually called miracles and prophesy). New truth can break out of scripture properly understood by the church. That is where you theologians come in. And The Holy Spirit. I don't see "Slavery is Good" as an underlying "Idea" in the Bible, especially if I understand Jesus as the lens through which I am approaching things. Now, if you tell me that "Treat people the way you wish to be treated" is the underlying idea, that is different. Like I said, this is the area that calls for work. Inerrancy seems, for lack of a more sophisticated metaphor, to be focused on the words in the text to the exclusion of the ideas much the way that poor man I heard about who never could appreciate the forest because of all those trees in the way. I agree with how you are interpreting. I just don't think it is captured at all in your definition. That's kind of the problem with definitions like that: They oversimplify things that are rich and complex and nuanced. Even worse is when we make them into a litmus test for inclusion. I think you are right that slavery is not an underlying idea, but rather something from the culture. The issue though is that we should not just be swallowing whatever our culture says is "normal" but should be pushing for the kingdom of God. It is odd that Paul would say if someone is a prostitute they must stop and repent. But if someone owned slaves that was okay. We would not say that today. So this was a huge cultural blindspot they had. The question today is: what are our cultural blindspots that we as followers of Christ should be working to reform in our culture? Outstanding article and work Derek. Not sure where I land but thoroughly enlightening. So glad Boyd is talking with you face to face via Skype. Thanks Brad. What are some of the questions that linger for you? Not sure I have any of the answers. I'm asking more to understand where you are coming from. "Even worse is when we make them into a litmus test for inclusion." Not for me they don't. Our former church is Christian first, calvinist way down in the list, and only evangelical if we are doing something with christians from other denominations. I no longer consider myself an evangelical! Why bother. So applying the underlying idea, we then question Paul. Applying the underlying idea, we then question the exclusion of our LGBT brothers and sisters. That is what i am hearing from both you and Greg. The difference seems to be mostly in your definitions. For you, infallibility seems to mean that the readily accessible text should.be completely true while Boyd is ok with digging to find it. The good news is that you both agree on digging.with a Jesus shaped shovel. Can ya dig? That sounds like a fair summary. I personally do not find that thinking of Scripture as "infallible" is at all helpful to me in knowing how to read it differently than I would otherwise. To me saying "this text cannot fail you" would not indicate that I need to dig or that I need to identify a trajectory, but just the opposite. So I just don't find the term at all helpful or descriptive. If others like it and it helps them, that's totally fine. I just don't get it at all. From my perspective, if I need to dig to find more, what I'm looking for is not really the text, but something deeper behind the text. I'm looking for Christ. Christ is infallible then, not the text. I observe that the text can fail. Paul saw that. He read the text before Christ and got it all wrong. So we need to read in order to find Christ. Christ is the focus, not a book. 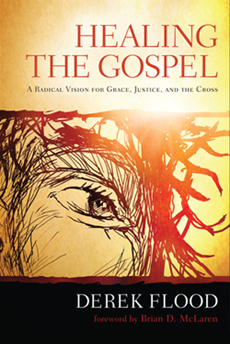 The book is a source, but only when read in the a Jesus-shaped way. That's a focus I find practically helpful in identifying how to read and how not to. "Christ is infallible then, not the text." This all day everyday! My brain is too small to understand why this isn't an appropriate answer for everyone. Yes, I think so too. It is something I have heard a lot of folks saying. In particular, Karl Barth and Stanley Grenz. I'll blog about that more next time. Thank you Derek Flood for being committed to the way of reconciliation in the midst of a theological conversation. I appreciated your comment where you said, "while we do not agree on everything (and, hey, who does?) -- perhaps there is a way to understand our two perspectives as working together, rather than as being in conflict. Perhaps I'm the peanut butter and Greg is the chocolate in a Reese's (two great theologies in one candy bar...)." I thought that comment really opened my mind to the transformative power, not of one individuals thoughts, but how the church collectively is unified by our trinitarian God that we get to be a part of. Thank you for prizing the ministry of reconciliation with your whole mind. I hope to meet you one day and talk with you, either in this life or the next (or the one after that ;). May God bless you and your family. Thanks Joel. I've got to give credit to my wife too for keeping me focused on relationship. As a guy I can easily get tunnel vision with my nerd theology and lose the focus on people and relationships that really matter. She keeps me grounded. Are Faith and Science Enemies or Allies?